Laykold tennis courts have just gotten greener! APT is proud to announce that their new Laykold Masters line now offers two systems made with recycled tennis balls. APT has teamed up with Ace Surfaces to create the very first cushion court with a shock pad that utilizes up to 10,000 recycled tennis balls in a single tennis court! 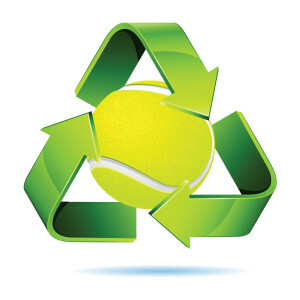 Finally, after a tennis ball has had it’s last bounce, it can be recycled and used again instead of rolling into a landfill. Each year, 130+ million tennis balls are consumed in the US and approximately 325 million worldwide. That is enough tennis balls thrown away annually to fill 6,000 semi trailers top to bottom or fill the Empire State Building to the 62nd story! After years of research, product development and teamwork, a recycling program finally exists. The formula for success combines the reach, expertise and lead of reBounces and other partners such as HABU and Project Green Ball to collect, sort, clean and ship retired tennis balls. Ace Surfaces and Laykold Masters take the now ground up, recycled tennis balls and incorporate them into revolutionary cushion indoor/outdoor sports surfacing systems: Laykold Masters 5 and Laykold Masters 8. We are excited to announce the first installation of the Tennis Ball Courts at Tenafly Racquet Club in Tenafly, NJ is going on now. “We are extremely excited about the new Ace Surface courts we are installing at the Tenafly Racquet Club. We love being the first tennis facility in the country with tennis courts that are partially made out of recycled tennis balls while being eco-friendly. Those that found hard courts to be difficult on their hips, knees and back will be pleasantly surprised by the difference the surface will have on their body. We hope to see other clubs in the country follow our lead in making the sport more enjoyable while helping the environment” said Gordon Uehling, Founder and Managing Director of Tenafly Racquet Club. For more information on this exciting new program, please visit www.tennisballcourts.com . Be sure to stay tuned to APT’s news feed and Facebook page for updates on the new recycled ball courts at Tenafly!